That concludes our live coverage for today. US aid: Genuine help or Trojan horse? Venezuelan President Nicolás Maduro continues to be defiant in the face of growing international pressure. In a tweet (in Spanish), he writes: "Our people have come to the streets of Caracas and all our country with the firm determination to defend the peace of Venezuela and to tell Donald Trump and the American empire: Yankee Go Home!" Mr Maduro also posted pictures of his supporters rallying in Venezuela today. Many Venezuelans have for years been trying to escape their crisis-hit country and enter Colombia over the Simón Bolívar bridge. So, if you want to know more about the so-called "bridge of desperation", here's a long-read by the BBC's Katy Watson. Four people are now said to have died in clashes today in the city of Santa Elena de Uairén at the Venezuela-Brazil border. Media reports, citing human rights groups and local hospital officials, say more than 20 people were also injured when Venezuelan security forces opened fire on demonstrators. At a rally in the Venezuelan capital, Caracas, President Nicolás Maduro expressed his anger at his Colombian counterpart. "Never before [has] a Colombian president fallen so far and done what Iván Duque has done against Venezuela," he said. "Never before. Never. "He seems innocent, with an angelic face, but I would grab his cheeks and tell him you are the devil, Iván Duque. You are the devil." While tensions flared on Venezuela’s borders, there was relative calm in the capital, Caracas. Thousands of people turned up for an opposition march, many dressed in white, a symbol of peace. "More medicine, fewer bullets," read one of the signs carried by the demonstrators. Another read: "Maduro, you’re the cancer of Venezuela." The crowd marched to the military barracks - all part of a strategy to pressure the armed forces to side with Juan Guaidó and let the humanitarian aid in. One woman described today as "breaking point" for Maduro. It’s certainly a test for the president. But apart from a handful of defections at the border, so far his senior officers have remained loyal. And there are still those who back Maduro over what they say is a trojan horse in the form of US humanitarian aid. Not far away from the opposition march, Chavistas and government workers gathered, many dressed in red - the colours of the president’s socialist party. "Hands off Venezuela", was the message from here. "If they want to help, lift all the sanctions against our country," state worker Frank Marchan told me. "We don’t need their mercy." Supporters of Juan Guaidó are trying to save humanitarian aid on board a burning truck on a bridge at the border line between Colombia and Venezuela. According to Reuters, Luis Almagro, the secretary general of the Organization of American States (OAS), has said President Maduro is not in a position to break relations with Colombia because he is not Venezuela's legitimate president. The OAS was founded in 1948 as a body to promote regional solidarity and co-operation. It has 34 participating member states in the Caribbean and North, Central and South America. In the same statement, Colombia's foreign minister, Carlos Holmes Trujillo, said: "Colombia holds the usurper Maduro responsible for any aggression or violation of the rights of Colombian officials in Venezuela." News agencies are now reporting that a second person has died at the border with Brazil (see previous post at 19:47). The incident occurred during a confrontation between crowds and Venezuelan security forces in the of Santa Elena de Uairén. This comes after two people were killed near the border with Brazil on Friday. One truck carrying humanitarian aid went up in flames at the Colombia-Venezuela border, footage from Venezuelan TV showed. Images showed people were removing boxes of supplies from a second vehicle at Francisco de Paula Santander bridge. Juan Guaidó later accused the "usurper's regime" of trying to burn the truck, but added that "brave volunteers" were acting to protect the aid. Venezuelan newspaper Correo del Caroní is reporting that one person has died and several others have been injured during clashes at the border with Brazil. The report states a 26-year-old man died in hospital as a result of wounds sustained when national guard officers released tear gas and fired shots in the Venezuelan border city of Santa Elena de Uairén. President Nicolás Maduro and his wife Cilia Flores danced to cheering crowds of supporters during a pro-government rally in the Venezuelan capital, Caracas, on Saturday. 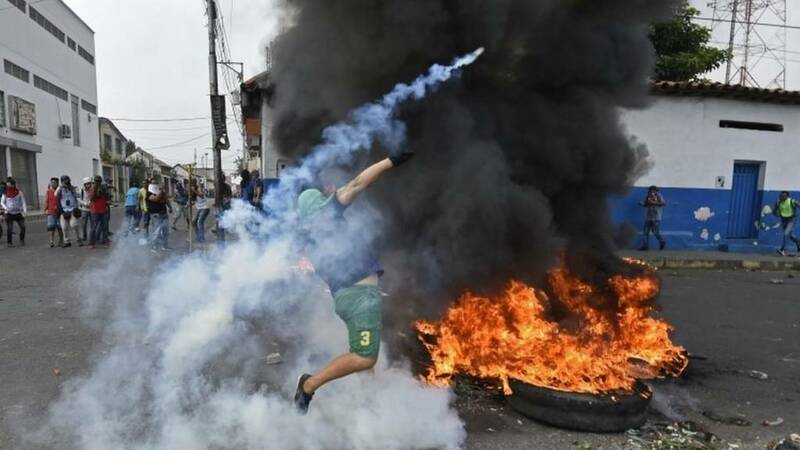 The move was criticised by some on social media, who pointed out that it came during fierce clashes at the country's borders with Colombia and Brazil. President Maduro says he has cut relations with neighbouring Colombia, according to Reuters. He has expelled diplomatic staff from the Colombian embassy. "Patience is exhausted," he said in a speech, adding: "I can't bear it anymore, we can't keep putting up with Colombian territory being used for attacks against Venezuela. "For that reason, I have decided to break all political and diplomatic relations with Colombia's fascist government." President Maduro said the diplomatic staff would leave Venezuela within 24 hours. Why is the military backing Maduro? President Maduro's position looks shaky, but the military may still have reasons to keep him in power. If holding lucrative positions is one incentive for members of the armed forces to keep Mr Maduro in power, the fear of being held to account could be another. Journalist Dylan Baddour has tweeted images showing protesters at the Simón Bolívar bridge covering their faces and retreating as tear gas is reportedly released nearby. Independent Venezuelan news website Efecto Cocuyo later tweeted a photo which it said showed an ambulance transporting protesters wounded at the bridge to a nearby hospital. Protesters have also been rallying on the Venezuela-Brazil border, more than 1,000km away from the Colombia frontier.Image caption: Protesters have also been rallying on the Venezuela-Brazil border, more than 1,000km away from the Colombia frontier. Venezuela's spiralling political and economic crisis may look confusing - as many actors both internal and external are involved. So, let's take a closer look at what's behind the turmoil.